Maybe it is because of the change in fields and scientific environment, but I increasingly doubt data presented in talks, posters and articles. Mostly because I find myself wondering whether the choice of statistical description of the data makes any sense. I am not speaking of advanced statistics at all, just the simplest descriptive techniques and the choice of the right plot for it. figure 1. 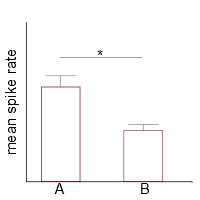 X represents spike rates, categories cell types A and B respectively. Whisker indicates standard deviation. My doubts are usually raised when I see a bar plot as sketched in figure 1. What looks like a rather okay representation of data actually does not really give you an intuitive idea of how the data are distributed.